Place all the ingredients for the marinade into a food processor and whizz up until you have a smooth paste. Rub this into the beef until everything is coated. Cover with cling film and place in the fridge for about 4 hours (or more if you can). Bake the baguettes to the instructions on the packet. Once the baguettes are cooked leave to completely cool down. While they're in the oven prepare your slaw. Blanch the bean sprouts by pouring boiling water over them in a saucepan and leave for about 4-5 minutes. Drain and set aside to cool. Put all the chopped ingredients for the slaw into a bowl, once your bean sprouts have cooled add them too. Add the sriracha mayo, mirin, coriander, lime, black sesame seeds and season with salt and pepper. Mix it all together and set aside. Take out the beef, add the white sesame seeds and stir in. Heat the sesame oil in a large frying pan and cook your beef for about 3 minutes, you might want to do this in batches. Rest on a plate for 5 minutes. While the beef is resting stir-fry the carrot strips for a few minutes in the same pan. Slice the baguettes in half lengthways. 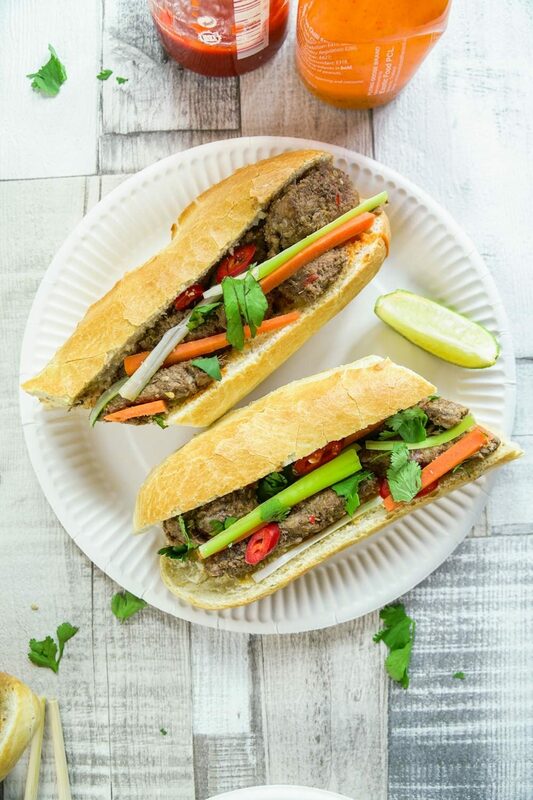 Spread the bottom half with sriracha mayo (or normal), then start to add the filling, starting with the beef followed by carrot, spring onion, red chilli and coriander. Cut your baguette in half and serve with a large helping of slaw and a squeeze of lime. Enjoy!